“Displaced from their apartment in the city, Lillian Hoffhienze-Bachman and her husband Jay are offered the previously abandoned Hoffhienze family home. But this lucky break soon turns into horror as a century’s worth of abuse, dysfunction and violence is revealed. Lillian becomes consumed with her sordid ancestry, terrified that the past might dictate her son’s future. 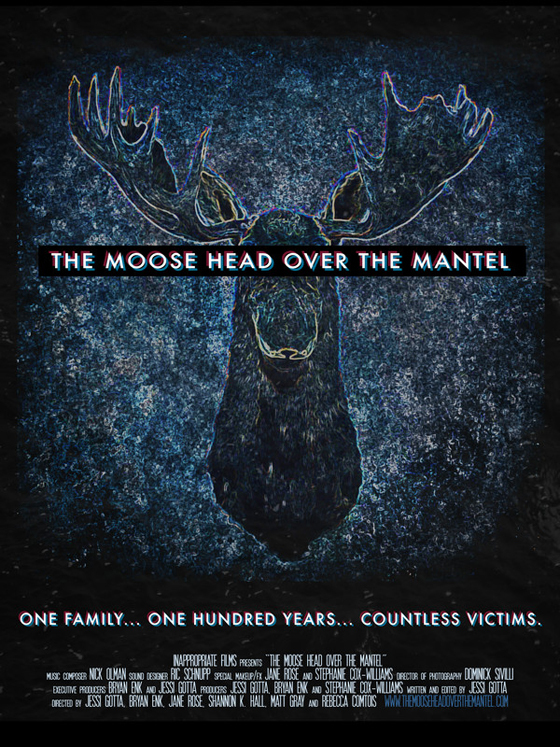 The above is the official synopsis for The Moose Head Over the Mantel – the latest feature from Inappropriate Films and it very accurately introduces us to what we are to expect from the talented minds of Jessi Gotta, Bryan Enk, Jane Rose, Matt Gray, Shannon K. Hall and Rebecca Comtois. Cleverly using a moose head as witness to the unfolding generational events along with effective sound design from Nick Caramela including some jarring (in a good way) bass notes, heightens the already unsettling soundscape of this stylish offering from this ensemble of award-winning filmmakers out of New York. Dominick Sivilli’s fine cinematography hints at cameras placed about the creepy house – at the center of the unfolding drama – as if what we are witnessing is Found Footage, even though this is not what is actually presented here. The lighting is beautiful and atmospheric and appropriate to a genre offering which is all about oppression, darkness and cruelty. Some of the performances are a little theatrical and at these moments I was pulled out of the otherwise cinematic feel of the production, leaving me with the feeling of having spent a night at a particularly lavish theatre. These moments were, though, thankfully rare. Having grown weary of cinema’s obsession with violence against women, I found the violence here of a particularly disturbing nature – some of the blows meted out are very effectively realized and there are genuinely refreshing and original flourishes of sound design married with the impressive imagery – especially the arresting montages of picture postcard glimpses of the bygone behaviors of this dysfunctional family, down through the generations. Apart from the sublime camerawork of Sivilli, the arresting sound design of Caramela, the fine writing, courtesy of Gotta and confident helming of the myriad directors (each have captained a different period of family history) those also in need of mention for their sterling efforts include Art Director Stephanie Cox-Williams, Costume Designer Karen Flood and Production Designers Chris Connolly and Timothy McCown Reynolds. This team deserves special kudos for the careful and meticulous settings and period detail. Moments of theatricality aside, The Moose Head Over the Mantel is a stylish, disturbing, energetic and insidiously creepy look at a family history that most would want erased permanently from the family album. 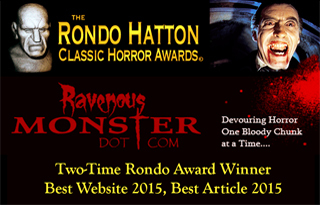 This film is a very worthy addition to the horror genre and comes highly recommended for its originality and, indeed, its beauty.